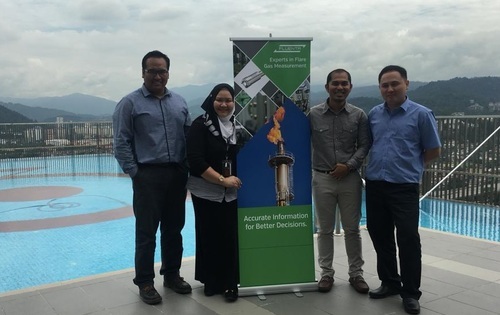 November 12, 2018: Fluenta, a global leader in ultrasonic measurement and management technology for the oil and gas industry, today announces the opening of its new office in Kuala Lumpur, Malaysia, to serve the Asian market. Sigurd Aase, CEO of Fluenta says; “Fluenta’s new Malaysia office presents us with the opportunity to expand in Asia during a time of significant growth for the oil and gas and chemicals industries”. Made possible by the acquisition of local agent Specs Asia Pacific Sdn Bhd, Fluenta’s new Asian office and sales team will be led by Azzumar Razali, Sales Director for Asia Pacific, who joined Fluenta in January 2018. The acquisition provides customers with a team already familiar with Fluenta equipment and experienced in working in local markets. With government regulation increasingly strict for monitoring flare emissions across the globe, Asian companies are under pressure to accurately measure and record gas flow. Fluenta’s FGM 160 meter uses an ultrasonic measurement technique to measure gas flow, complemented by ultrasonic transducers that cover a wide range of gas temperatures and pressures. Fluenta’s non-intrusive transducers do not interrupt gas flow and can be used across a wide range of pipe diameters - from 6 to 72 inches. The FGM 160 achieves pinpoint accuracy across a varied flow and temperature range by deploying both wide band and dual frequency techniques. “After joining Fluenta in January, Azzumar made an immediate impact on the success of our business in Asia. Our investment in a new office and regional team will better position us to serve our customers looking for market-leading measurement technology in Asia,” comments Julian Dudley-Smith, Director of Fluenta. Founded in 1985 Fluenta is a global leader in flow sensing, measurement and management using ultrasonic technology. The company serves the chemicals, petrochemicals and oil & gas markets, where it is the leader in European off shore flare gas monitoring. Fluenta originates from Norway and has offices around the world, including the UK, Norway, Malaysia and the USA. This press release was distributed by ResponseSource Press Release Wire on behalf of XL Communications in the following categories: Business & Finance, Manufacturing, Engineering & Energy, for more information visit https://pressreleasewire.responsesource.com/about.